Ohio State is 30–15 all-time against against Michigan State and is 14–9 as the home team. The Spartans' 2017 offense will have a new look in the passing game. Starting quarterback Tyler O'Connor and four of the team's leading receivers will not be back this year. In all, the four receivers accounted for 1,939 of Michigan State's 2,668 receiving yards. With the passing game under renovation, Mark Dantonio will lean on running back LJ Scott. As a sophomore, the Ohio native led the Spartans with 994 rushing yards and six rushing touchdowns. Look for Scott to get plenty of carries, especially early in the season. With this contest coming later in the season, Michigan State should have plenty of time to get the offense balanced. With that said, Ohio State's young secondary will have nine games under its belt. The Buckeyes should win consecutive games against Michigan State for the first time since 2007 and 2008. 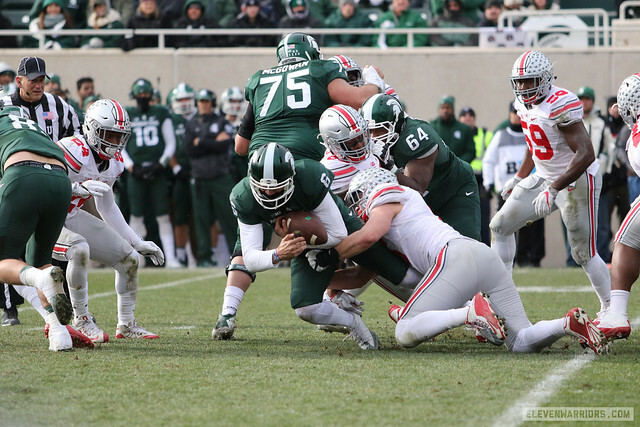 Ohio State played Michigan State, the second ranked Buckeyes won 17-16 in East Lansing. The Buckeyes played the Spartans in Ohio Stadium, No. 9 Michigan State upset No. 2 Ohio State 17-14 in horrible conditions. Ohio State beat MSU in Ohio Stadium was 2007. Jim Tressel's No. 1 Buckeyes defeated Mark Dantonio's first team 24-17. Ohio State played the tenth game of the season at home was 2012. The No. 6 Buckeyes defeated Illinois 52-22. The Buckeyes lost the tenth game of the season was 2011. Purdue upset Ohio State 26-23 in an overtime game played in Ross-Ade Stadium. Ohio State was defeated at home on the tenth game of the season was 2001. Jim Tressel's unranked Buckeyes lost to Ron Turner's No. 12 Illini 34-22. Coaching Status: Mark Dantonio (90–42) 11th season. QB Tyler O'Connor completed 154 of 262 passes for 1,970 yards last year. He accounted for 16 of Michigan State's 19 touchdowns. Four of O'Connor's top targets from 2016 are also gone. WR R.J. Shelton led the Spartans with 53 receptions, 789 receiving yards and 5 touchdowns. Donnie Corley (453 yards // 33 rec. // 3 TD), Josiah Price (387 yards // 38 rec. // 5 TD) and Monty Madaris (310 yards // 24 rec. // 1 TD) are also gone. With the majority of the passing game missing, Mark Dantonio's offense will lean heavily on LJ Scott. Corley was a freshman last year, but is off of this year's team due to sexual assault charges. CB Darian Hicks, and his team-leading 2 interceptions, will also need replaced. This is the 21st time the Buckeyes have played on November 11th. No. 1 Ohio State defeated Northwestern 54-10 in Evanston the last time the program played on this date. The Buckeyes have won 11 of the last 12 games played on Nov. 11 and 5 consecutive. Ohio State has only played one ranked opponent on the 11th of November. In 1950, Wes Fesler's second ranked squad defeated No. 15 Wisconsin 19-14 in Ohio Stadium. 1922 was the last time the Buckeyes lost a home game on this date. Amos Alonzo Stagg's Chicago team defeated John Wilce and Ohio State 14-9. Ohio State is 55–8–3 when playing the tenth game of the season and is 31–3–1 when playing the tenth game at home. Mark Dantonio is 108–59 as a collegiate head coach (Cincinnati and Michigan State). Ohio State has played 13 games as the home team on 11/11 and is 10–2–1. The Buckeyes are 2–0 when the tenth game of the season is played on November 11. No. 13 Ohio State went to Champaign and defeated Illinois 24-21 in 2000. In 1995, No. 2 Ohio State defeated Illinois 41-3 in Columbus.